Underground parking lots. Pedestrian plazas. A brand new quad. You may be surprised to find out just what planners have in mind for the Homewood campus of the future. 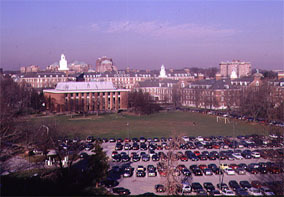 A New "Plan for the Century"
Surrounded by the busy city streets of Baltimore, the Homewood campus is a refuge of shaded quadrangles and Georgian architecture. Walk west of vehicle-clogged North Charles Street, through the front gates of the university, and behind the glass-walled library you will find two charmingly peaceful academic quads, a haven from the modern-day bustle of neighboring Charles Village. In the shade of Gilman's clocktower, Homewood hardly seems to be an urban campus at the tail end of the progress-laden 20th century. But it is. Take a walk away from the two main quads, and a Pepsi truck competes with pedestrians for access to Levering Hall. At the Athletic Center, vans line the sidewalk next to the baseball diamond--a reminder that Homewood is in a city neighborhood notably short on parking. The post-war pink facade of Merryman Hall, the '70s-era slit-like windows of Garland Hall, and the space-age design of the Bloomberg Center for Physics and Astronomy all serve as reminders that since Hopkins moved to the Homewood campus in 1914, the university has continued to grow. Now add in plans for more buildings. The new $17 million student arts center--a 50,000-square-foot, three-part building just south of the Milton S. Eisenhower Library--is already well on its way to its expected completion next fall. Construction on Clark Hall, a 55,000-square-foot biomedical engineering building, will begin in late winter on land just south of Garland Hall. In addition, the Hodson Trust has committed $13 million to build a classroom building that will replace Merryman (which was constructed with Army surplus materials in 1948 and meant to be temporary). Farther north on campus, workers will break ground this spring on a 62,000-square-foot addition to the White Athletic Center. The Homewood campus is growing--that much is obvious. And as the university continues to grow, as it moves into the next century, it needs an agreed-upon direction in which to expand. The university needs a plan. Enter Ayers/Saint/Gross. Last spring, the university commissioned the Baltimore-based architecture firm to develop the first new campus master plan since Hopkins moved to Homewood nearly a century ago. Adam Gross, principal of ASG, heads the team of architects involved in the yearlong process that will culminate in May with the presentation of the new master plan, a plan that Gross calls "a compass and a map." "The map part of the plan is a prescriptive series of recommendations about where the edges of future buildings go to create open space. The buildings themselves, what happens inside those buildings, is really less important than how they frame quads," says Gross. "The compass part is more an ethical series of issues. Every time we make a decision about physical planning, we say, 'Is this going to support the academic mission of the place?'" ASG has been involved with a number of Hopkins projects over the years, including the design of Shriver, Barton, Garland, and Mudd halls, the MSE Library, the Bloomberg Center for Physics and Astronomy, the Newton H. White Athletic Center, and renovations to Krieger and Maryland halls. 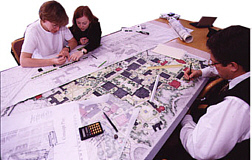 And the firm is also not new to campus planning, having worked on campus plans at the University of North Carolina-Chapel Hill, the University of Georgia, Emory University, George Washington University, and the University of Virginia. At Homewood, the planning process began last spring with an in-depth survey of the geography and design of campus, continued over the summer and fall with hundreds of hours of interviews with faculty, students, and staff, and will continue further through the spring as the ASG team conducts in-depth studies of each area of campus and develops aesthetic standards. The process is a long one, but for good reason. As Gross points out, Homewood's original campus master plan dates back to 1904. In his words, it has been "a plan for the century," and as the next century unfolds, he intends the new master plan to fulfill the same mission. The 1904 plan, developed by the Baltimore firm of Parker, Thomas, and Rice, established guiding principles for architectural style and placement of buildings. The plan anticipated new buildings years before they were built. When Gilman Hall was constructed in 1915, for instance, its brick arcades led nowhere. Only decades later would they link up to Mergenthaler (1941) and Ames (1955) halls. And so campus evolved in accordance with the plan. Eventually, however, the scope of the original master plan was exceeded, and so although campus has continued to expand since the completion of the Upper and Lower Quads, it has done so without the guidance of a master plan. That is, until now. When Clark Hall is complete, it will be the first new building on what will become a new quad surrounding Garland Field. The new quad will extend the philosophy of the original upper and lower quads--that a university campus is a place to walk, not drive. That return to a pedestrian-centered campus is at the heart of ASG's concept plan (a first-draft master plan), presented to the university last September. During the observation process over the summer, the ASG team found what Gross describes as a "spaghetti system of roads"-- nonsensical in direction and ill-marked. Even Hopkins veterans often find themselves at a loss for words when a visitor stops to ask how to get from Point A to Point B. "Whether they are walking or driving, it is next to impossible to tell them how to get there," says Janet Sanfilippo, director of City and Community Relations. At certain areas around campus, such as between the MSE Library and the freshman dormitories, vehicles and pedestrians too often come into conflict, the ASG planners found. Other stretches of road, such as the one that runs between Garland and Levering halls, are regularly overrun by delivery trucks. "We know that it looks like a service entrance when you walk up to the front of the main administrative building," says director of undergraduate admissions Paul White, whose office is in Garland Hall. "That is not the best first impression you should get when you walk onto campus." The solution to all these problems is surprisingly simple--get rid of the roads. Rather than roads that penetrate campus and then branch into sprawling parking lots, truncate the roads and build parking garages on the edge of campus. 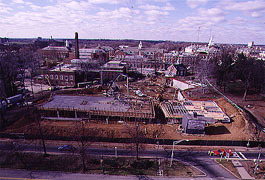 After considering almost a dozen circulation schemes, planners and administrators have settled on a road design consisting of three prongs--one from the north, ending at the Athletic Center; one from the west, ending behind the Hopkins Club; and one from the south, ending before Shriver Hall. A parking garage sits at each prong's end. With these three prongs, daily traffic is taken out of campus. Service vehicles still have access, via walkways wide enough to accommodate them, but new, less obtrusive service entrances reduce their visibility. And while cars are hidden in garages, the garages are also hidden. At the northern prong, the plan calls for a garage possibly embedded within a new set of spectator stands overlooking the baseball field. Another garage would be tucked away near the Hopkins Club, by building it into the slope on which the club sits. These parking facilities (as well as an enlarged Homewood Garage on the 3300 block of St. Paul Street) would allow the university to increase the number of available parking spaces to accommodate increased growth. "We don't want to promote driving, but we want it to be convenient for people to get here, park, and walk," says Suzanne Holden, ASG landscape architect. Minimizing the presence of vehicular traffic and parking, says Gross, will go a long way toward restoring Homewood's original sylvan setting--a concern that shouldn't be taken lightly. "Beauty is related to the values of excellence and academic quality. There is an undeniable relationship between buildings framing the quads, with trees, with people sitting under the trees reading books, that encourages an idea of inward thinking, an intellectual climate," he says. "Having seas of asphalt with cars sitting in them really doesn't contribute to those ideas." Seas of asphalt also don't bode well for the sustainability of the campus's natural resources. When the university first began building at Homewood at the turn of the century, the lushly wooded area was known as the "Homewood forest." William Wyman, who donated a large portion of the land on which Hopkins now sits, helped to ensure preservation of this natural setting by requiring the university to give 10 acres to the city to create a park; the parcel, at the extreme southern end of campus, became the Wyman Park Dell. Administrators also donated another 42 acres to create Wyman Park on the campus's western edge, through which Stoney Run Creek flows. Today, these natural systems are in a state of decline, a natural consequence of the extensive development of the land. Part of the goal of the new master plan, says ASG's Holden, is to pull up some of the asphalt from campus, to provide more green space, better water run-off, less soil erosion, and increased recreational space for students. The concept plan also strives to make the western woodlands more accessible to the core of campus. On issues like this, ASG is employing the help of the landscape firm of Michael Verguson Landscape Architects. "One of the things we love about this campus is that you have this natural, primordial space down by Stoney Run," says the firm's Doug Hays. The aim, he says, is to bring up "fingers" of green space, to provide a "linkage of the natural with the built." The hope is that by making the transition from campus to Wyman Park more fluid, students will be more apt to take advantage of the area for recreation. In considering the campus's outdoor areas, the ASG team is also creating a design standard that will guide the aesthetic development of campus. It will encompass everything from loading docks, to benches, to walkways. "We have observed a bit of rattiness--a not-as-cultivated quality to the landscape as we would expect to see at a world-class institution," says Luanne Greene, principal of ASG. Currently there is no consistent style of trash can or recycling receptacle at Homewood, Gross points out. While such details may seem trivial, consistency among trash cans, benches, and street signs can bring much-needed cohesiveness to a campus. Before ASG did design work at George Washington University, visitors to that urban campus did not know where the university began and where it ended, says Gross. ASG's simple solution: Create a consistent outdoor trash can (dark blue with a GW logo around the top). These receptacles have proved amazingly effective in delineating George Washington University's boundaries. At Homewood, rather than setting off boundaries, the goal is to better integrate the university into its urban surroundings, particularly with Charles Village. On an unusually warm November day, Gross stands in the middle of 34th Street, between Wolman and McCoy halls. A group of ASG architects, university administrators, and Charles Village residents look west down 34th Street and see the MSE Library. Behind it rises Gilman's clocktower. Before an approaching car forces the group to move to the sidewalk, Gross motions toward campus and says, "We want to visually extend the presence of the university into Charles Village and make it more pedestrian. We want to have more of a visual connection. Imagine this [street] without any cars here, all bricked over, with benches and lights." Gross describes transforming the block of 34th between Charles and St. Paul streets into a carless plaza, what he calls "an urban piazza between two dorms." Such integration will be crucial, given the university's ongoing expansion toward the east. In addition to most undergraduate housing, many student services and administrative offices now sit east of the main campus on the other side of Charles Street-- among them the Bunting-Meyerhoff Interfaith Center, International Student and Scholar Services, and Student Activities Office. Plans are under way to move the university's bookstore east, as well, from its cramped location in the basement of Gilman Hall to a prominent spot at 3301 North Charles Street. And even farther east on 33rd Street sits the recently acquired Eastern High School site. As the university expands into Charles Village, it does so with an ongoing dialogue with area residents and business owners. Community leaders appear to welcome the university's increasing presence. "There is an economic impact on the local businesses that the students, faculty, and administration have," says John Spurrier, Charles Village Civic Association (CVCA) president. "When you look at our real estate market, the demand for housing, especially rental properties, would not be what it is if Hopkins were not here." Spurrier is one of the onlookers on that November day as Gross describes his vision for a pedestrian 34th Street. In fact, Charles Villagers have been present throughout the process of creating the new master plan. One of the ways in which the university is working most closely with community representatives is to realize a joint goal of a redesign of North Charles Street. Both plans call for the main thoroughfare to be transformed into a symmetrical street with a center grassy median. Both existing service lanes would be eliminated, according to Sandy Sparks, chairperson of the North Charles Village Planned Unit Development Design Review, a committee of the CVCA. With pedestrian safety an issue, plans call for a redesigned Charles Street and a pedestrian bridge linking the new bookstore at 3301 N. Charles with the new student arts center. Delivery trucks currently clog the entrance to Garland Hall and other spots on campus. Removing roads on campus and adding service entrances should help ease the congestion. "That road was built and designed for a different era," says Sparks, pointing out that Charles Street was originally a country road, and Charles Village a sleepy suburb. "We now have a street that has much greater traffic." One result has been an increasing number of auto-pedestrian accidents, including the death in October of a female jogger at the corner of Charles and 33rd. Currently, the city of Baltimore is looking into the idea of a redesigned Charles Street. To further address the pedestrian safety issue, the Hopkins concept plan suggests the creation of a pedestrian bridge over Charles Street, linking an upper level of the the new bookstore at 3301 North Charles with the new student arts center just south of the MSE Library. Imagine a 1925 graduate returning today to 3400 North Charles Street. The Homewood House stills sits atop a grassy beach, but now there is also a glass-fronted library next to it. Gilman Hall is still the focal point of the main academic quad, but now, Garland, too, sits poised, ready for a quad of its own. The dorm AMR I is on the north side of campus as it was in the alum's youth, but now the area also contains a handful of other dorms. The university has moved forward over the last 75 years, and the momentum continues. Now imagine Homewood 50 years in the future. You return to campus from the south. Driving north on Charles Street, you see a pedestrian bridge stretching above the street. You wrap around the block and park in a garage off St. Paul. From the garage you walk to the bookstore on the corner of 33rd and Charles via another pedestrian passageway. You pass through the bookstore, cross the bridge over Charles Street, and arrive at the student arts center. Exiting the building to the right, you are in the middle of the outdoor plaza that connects the arts center to the library. Once again the campus looks familiar. Krieger, Ames, Gilman, Mergenthaler, and Remsen frame the upper quad. The shadows of buildings and trees provide shade for 20-year-olds sitting on benches, reading. The Homewood of the late 20th century is frozen here, in the present. From the upper quad, you walk down the breezeway's grand staircase, the same one you walked down every day to attend class on the lower quad. When you reach Shriver Hall you turn right, onto the Garland Quad. The buildings look the same as those in which you attended class years before (same brick, same Georgian architecture), but you have never before stepped foot in them. As you stroll across the grassy quad, you are unaware of the cars parked beneath you. You look south, and you see Wyman Park Medical Center tied to campus through landscaping and crosswalks. You look north, and you see Gilman Hall, watching over campus as it always has. At the end of your day, you stand in front of the MSE Library and look east. In front of you, a pedestrian-only semi-circle loops from Charles up to the library and then back down. A statue of Johns Hopkins sits in the middle of Charles Street, which is not a confused system of main and access roads but rather a two-way, tree-lined boulevard. Across Charles Street is a plaza between Wolman and McCoy, where, again, students sit on benches and read. You stand, and look at the front entrance of The Johns Hopkins University. It is elegant. It is ceremonial. And it is the product of years of implementing a plan. It is the end result of following a carefully constructed recommendation about how the university should grow, a recommendation still being developed. Nothing yet is certain. And even after the master plan is established, it will not be so rigid as to exclude adaptation. At a presentation of the concept plan to Homewood students, faculty, and staff last September, Gross stood in Arellano Theater and showed a slide of the university's 1904 master plan-- an image that showed a campus full of buildings, none of which had yet been built. He showed a photograph as Homewood stood in 1917, with Gilman Hall's arcades leading nowhere. He showed a photograph of Homewood in 1942, with a loop of road in front of an empty lot on which the Milton S. Eisenhower Library would eventually stand. And he showed an architect's rendering of what Homewood could look like at the turn of the next century, with buildings surrounding Garland Field, and a pedestrian overpass linking campus to Charles Village. At that meeting, President William R. Brody said, "None of this is going to happen overnight." Like the 1917 photograph showing the brick arcades leading from Gilman to the future sites of Mergenthaler and Ames, the master plan will be waiting, showing the way, when the university is ready to move forward.